Restorative Radio offers longform audio pieces that broadcast the sounds and voices of home to those behind prison walls. “By design, prisons are the most censored institutions in the country. Letters are screened, phone calls possibly tapped, visitation time is restricted, but radio can penetrate prison walls,” says Sylvia Ryerson ’09, who spoke at this year’s Shasha Seminar. The founder of Restorative Radio, she produces “audio postcards” to send the sounds of home to those in prison. The summer of her internship, the community was discussing the impending construction of yet another prison in the region. There were already seven new prisons within 100 miles of WMMT. Most of the country’s recent prison expansion has occurred in economically depressed rural areas—regions without public transportation and far from the cities that are home to the majority of prisoners, stressing crucial family bonds, Ryerson notes. 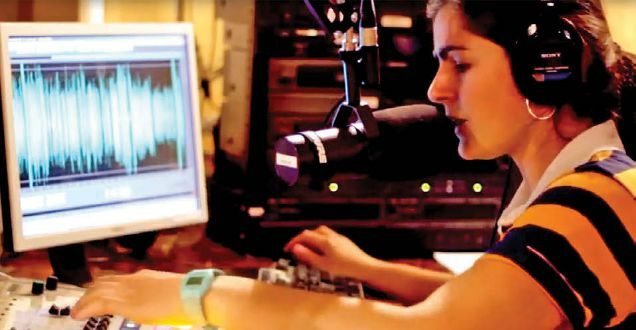 Returning to WMMT after graduation, Ryerson became a host of Calls From Home, a weekly radio show that o.ers a toll free number for prisoners’ families to record messages for broadcast. She began to plan longform pieces that would capture the voices of home in an immersive soundscape that would reach those in prison and appeal to a general audience. With some grant money behind her, Ryerson traveled the state of Virginia, connecting with people she’d known only by name and voice from the radio show. In the nine postcards produced so far, she’s recorded families hosting Sunday dinners, parents and siblings sharing favorite memories, and nieces and nephews offering greetings to an uncle they’ve never met. She’s recorded a grandmother attending church, and she’s helped a fiancée capture the sounds of daily life—a walk around her neighborhood, cooking pancakes for breakfast. While Ryerson says that the ultimate measure of the project’s success is what it means to families, her goal is to stimulate discussion and be a catalyst for change.